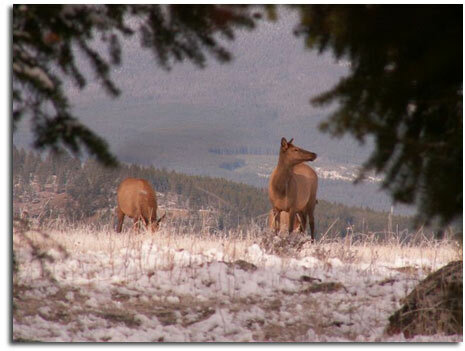 Check out this video clip of two bull elk coming into the meadow by our elk hunting camp! Our hunting area is set deep in the Sapphire Mountains of West Central Montana. Our elk and deer bow and rifle hunting camps are accessed only by horses and mules. The ride to our main camp is 2 hours through mild terrain. Elevations vary from 6500-8000 feet. Our main camp is 7400 ft elevation. The area consists of over 30,000 acres of timbered hills, dark timbered thickets and spotty burned areas. Small meadows and spring fed creeks can be found in every drainage. Elk numbers are strong in this particular area of Montana. 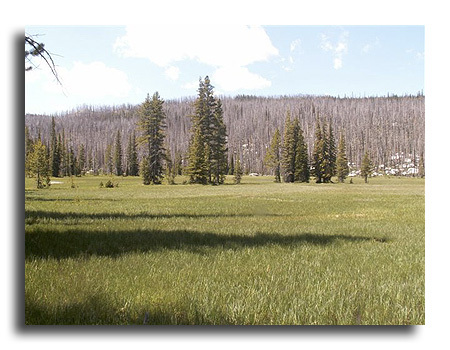 In 2000 and 2005, a portion of this area burned and has provided some excellent elk habitat for hunting. Bulls in the 260 to 320 Pope and Young range can be taken depending on hunter's physical shape, ability and the weather. Camps consist of comfortable 10 x 12 wall tents for the hunters (2 per tent) with a wood stove, and comfortable cots. A kitchen for serving good meals, a saddle fly by the horse corral, outhouse tent and shower setup will also be in main hunting camp. Our cook serves a wide variety of traditional home-cooked meals such as steak, pork chops, fried potatoes, pancakes, French toast, eggs, and breakfast meats. There's always an endless pot of cowboy coffee waiting for you. Please inform us of any food allergies or specific preferences so we may accomodate you. Our theory is to keep a small but comfortable camp and stay close to good elk hunting country. Most days we hunt by foot right from camp. We keep a minimum amount of stock at camp to help keep things quiet. It is common to hear bull elk bugling right from your tent. Women hunters are encouraged to participate! Our horses and mules are as gentle as they come. We run a horse packing and guide school during the summer months and use the same stock there. When you come out elk hunting, please bring realistic expectations. We want all of our potential hunters to understand that -- harvesting a bull elk on fair chase terms is considered one of the hardest and finest trophies to acquire. We could have hunts with 100% harvest success or others with 0%; these rates vary greatly with weather, physical ability and hunters willingness to hunt everyday of their trip. 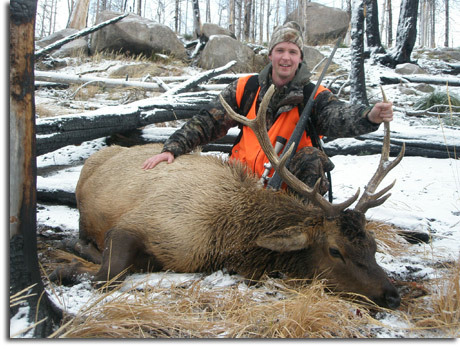 We do promise to provide you with a first class fair chase elk hunt. Remember that there is no western state that exceeds an average 25% success rate on elk. This is a physical hunt and you should expect to hike at least 4-6 miles per day. Elevation gains can be +/- 1000 feet. We suggest cardio training (stairs, treadmill) and leg strength (squats). We concentrate our elk hunting efforts in the mornings and evenings and often come back to camp midday. We do not hunt in the heat of the day when the animals are in their bedding areas; we don't believe it is a high probability of a kill and we don't want to run the animals out of the area. 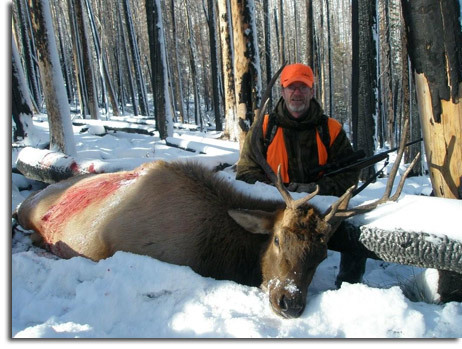 We have many pictures and references from our guided elk hunts, please contact us and we'll be happy to provide you with contact information for plenty of happy clients. Also please read our frequently asked questions about our elk hunts: Our Elk Hunt FAQ's. Click here to download our hunt reservation form and guide/client agreement.